The FX3G is an introductory compact PLC and is the newest addition to the FX3 series, designed for simple yet performance-critical applications. Incorporating innovative FX3 series technology the customer is presented with a suite of benefits. Easier programming by new commands and table configuration. 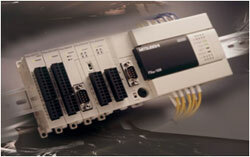 The FX3UC is the new ultra-compact high speed, fully expandable PLC. Based on 24V DC power and using connector-type transistor I/O, the FX3UC is designed for space conscious and modular applications. Created inline with the FX3U series, the FX3UC incorporates such attributes as built-in high speed I/O and the dual system-bus architecture, optimizing communication, networking, analog, and positioning control. Output Type Relay Sink Trans.,Source Trans. Sink Trans.